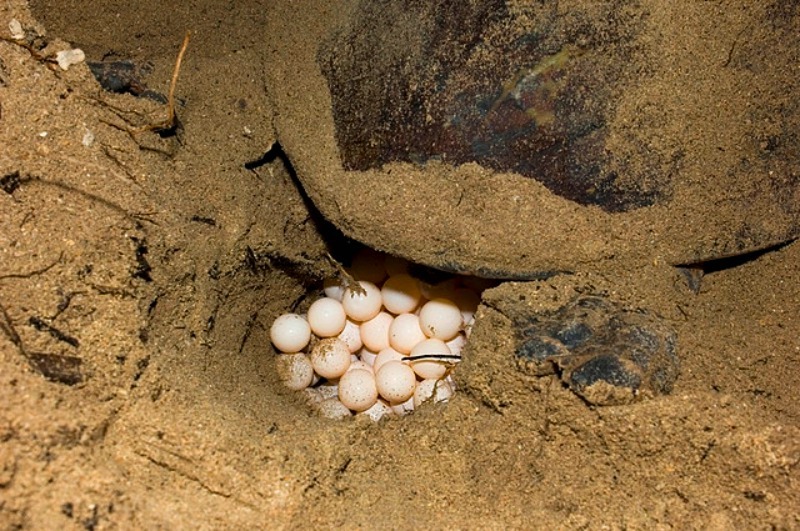 Hawksbill Sea Turtle Nests on our Island! Reef Conservation International (ReefCI) had a recent visitor to our island – a critically endangered Hawksbill sea turtle. Like other sea turtles, Hawksbills are threatened by the loss of nesting and feeding habitats, excessive egg collection, fishery-related mortality, pollution, and coastal development. Our Hawksbill came ashore to our small island in Belize and tried to nest but could not do so due to the hard, rocky sand. She tried digging her nest to lay her eggs but the sand was too compacted and difficult to dig through. Unfortunately, the island has changed a great deal since she was born on our island 25 years ago. To help, the ReefCI volunteers dug a huge sand pit, removed all the roots and large rocks and refilled the area with loose sand. Our hopes were that she would return for a second try the following night. And to everyone’s wonder and amazement, she came back and found our freshly dug pit with loose sand and she dug her nest and laid 105 eggs!!! The best part was that our volunteers played an integral role in making this happen and then got to witness the whole event – her digging the nest and laying the eggs. It was such a rewarding experience for all involved. It was in a word – magical!! During the summer of 2018 our volunteers continued improving the habitat of our island by creating suitable loose sand sites.